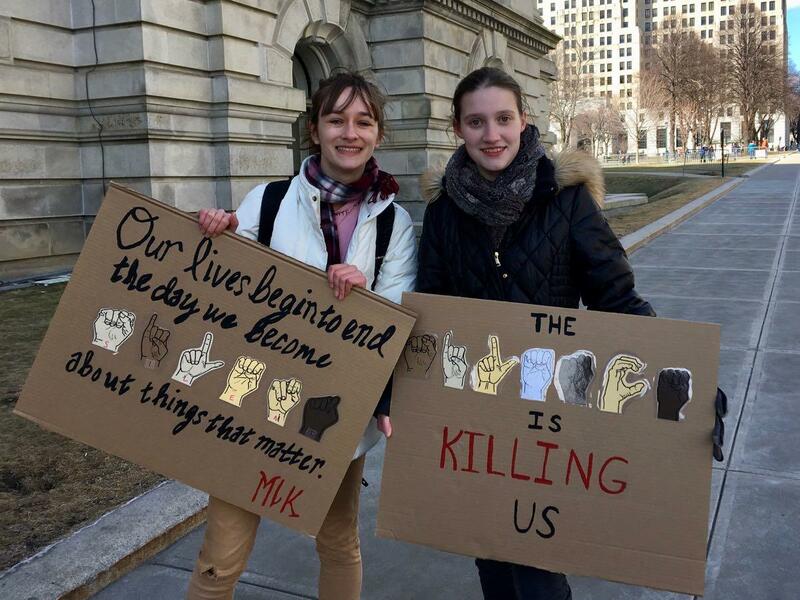 Kaelyn: I definitely think it's because of the spirit that the Parkland students had after the shooting at their school. It's sad that it had to happen after 17 more kids died. But we are the generation that has grown up doing lockdown drills since Columbine. This hasn't happened for any other generation in our country. 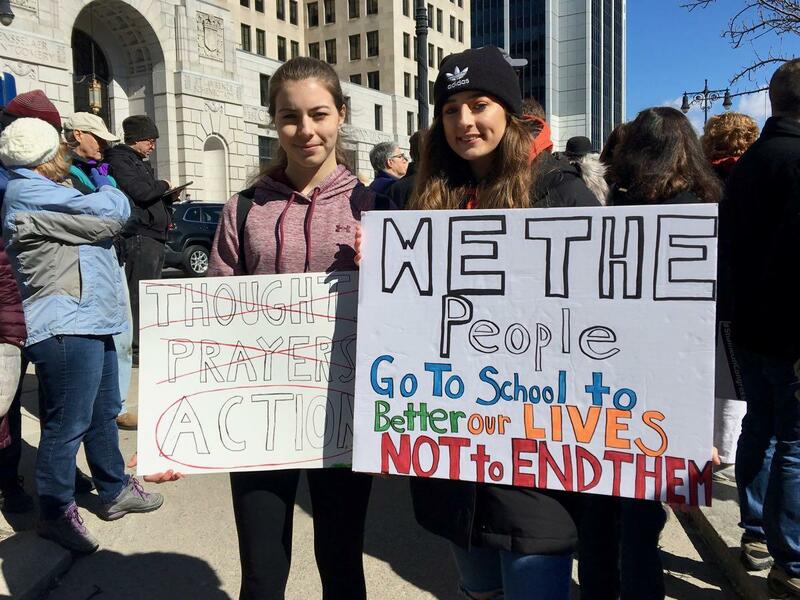 We want to see our politicians start advocating for our lives, and the ones that take NRA blood money and don't advocate for our lives -- we want to see them voted out of office. This isn't the end, it is the beginning. One of the biggest ways you can use your voice in this country is by voting. And we're going to start voting. Hamza: I'm from Pakistan. I moved here six years ago and there was a similar news story a few years ago where 150 kids died in a school in Pakistan. I thought, "That is horrible." And similar things have been happening here, but more frequently. I thought, "This is the most powerful nation in the world and the world looks to us as an example and this should not be happening here." 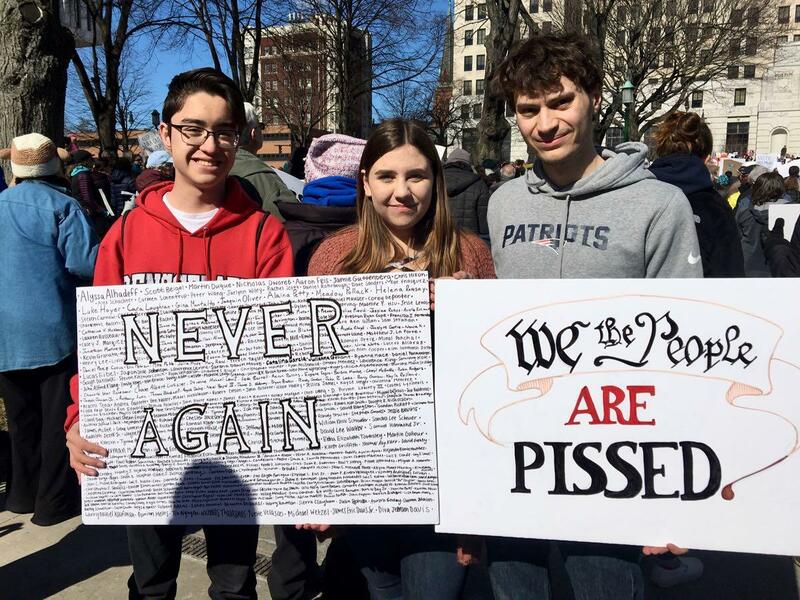 When I saw this on the news in Parkland -- that really moved me, and the spirit of the students that started this whole movement really inspired me to be involved. Just being part of a national movement for our generation is really important. 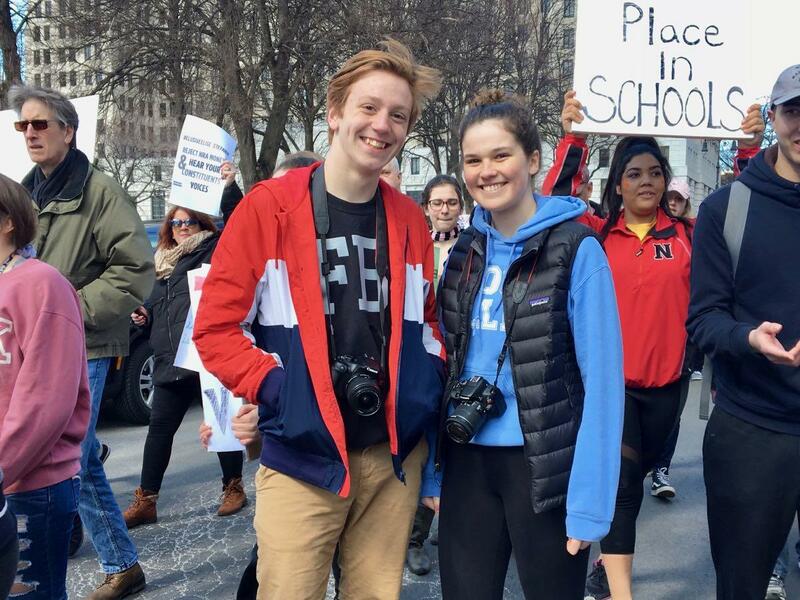 So that we are active and we know what is going on in our politics and we see our representatives and we see as a community what we can do -- so students see their voices are being heard. 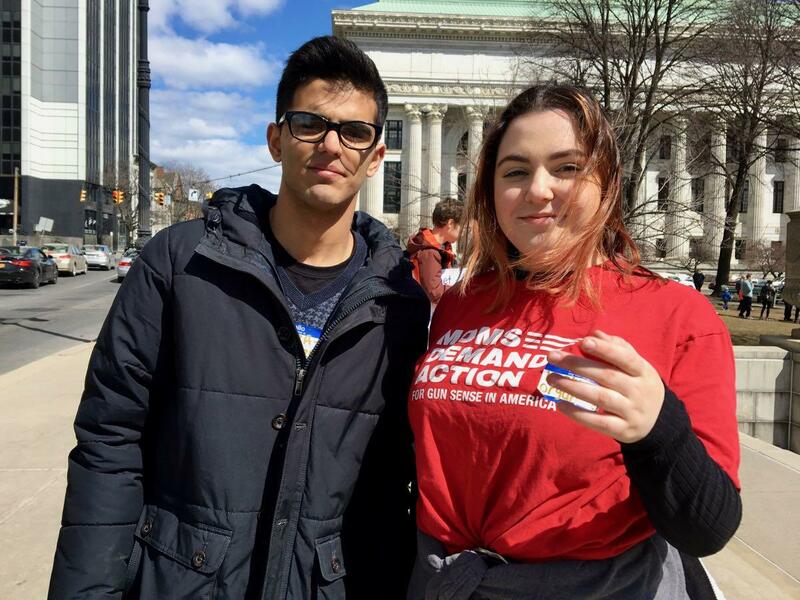 Hamza:For us to raise the age for when you can buy a gun from 18 to 21 federally and ban all automatic and semi-automatic weapons. Normal citizens should not need to buy those weapons. And stricter background checks so that something like the shooting in Parkland can never happen again. Is there common ground on this issue? Hamza: In the case of stricter background checks there is definitely common ground. I want both sides to realize we are not against the Second Amendment. We just want school safety. Why has this movement been successful so far? Hamza: Technology is probably the biggest thing -- but we are using it in a positive way We can spread the word about this march in five minutes and it will get to thousands of people. And from now on the campaigns are going to be on social media and we are going to be on it more than the adults. Luke: The irrational idea to give teachers guns is so stupid. Everyone has had a scary teacher or a teacher they don't feel safe around. Imagine giving those teachers guns. There would be so much fear in schools. Katie: I think it just got to a point where it didn't feel safe in school anymore. I was really afraid for the lives of my friends and my siblings and my fellow students. I want to see a world where AR-15s are not available to the public. I want to see a world where we can be safe in schools and we can improve security, make our learning centers a better place. I think gun control is something we need to find common ground on because if we don't there is never going to be any change because there's going to be more of us dying in schools. But we are going to keep fighting and we are going to keep moving toward a better future. I thought this moment was for me. It gives students a voice. Why do you think it's taken off? Katie: I think that social media is really contributing to it, but in the past there have definitely been a lot of movements that have been pushed forward by the youth of America. And I really like that we are continuing that legacy, and our generation has stepped up to make a change. James: It's a cause we really support. 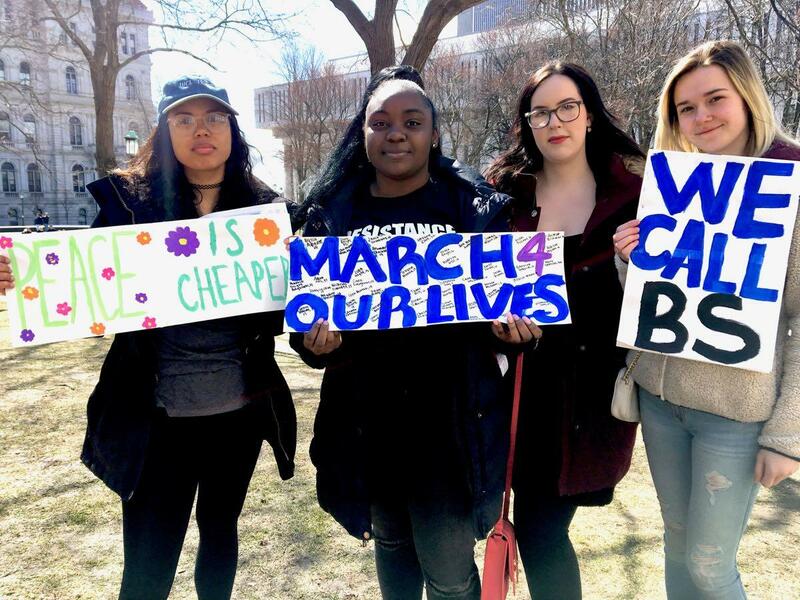 There has been way too many gun violence deaths in this country and with everything that has been happening there has been zero change whatsoever, so we feel the need to come out here and say we want change and we want to make that happen. I think in a way there is common ground on this issue and many people just refuse to see it. I don't think there is a single person out there that wants kids to die in school shootings. 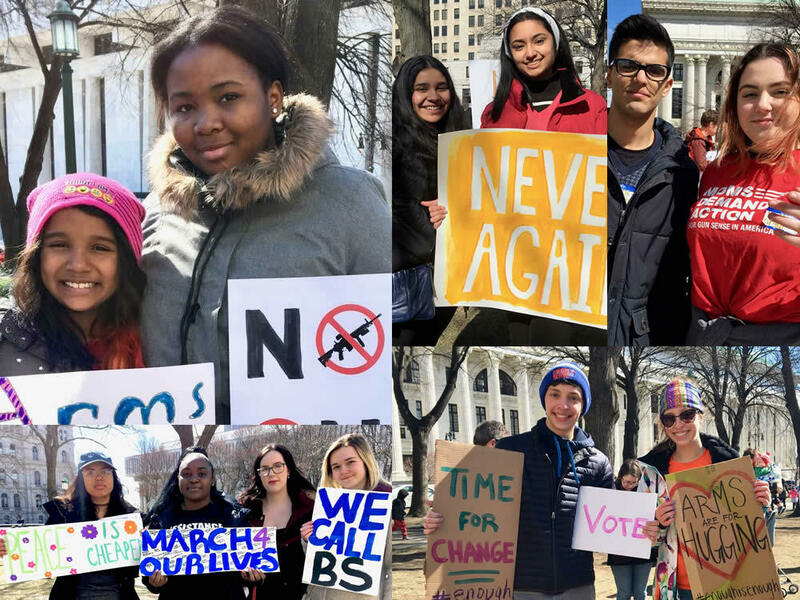 There are just different ways of approaching it, and we truly believe that the best way to stop school shootings, stop mass shootings is to fight for gun control rather than for other issues. Jessica: The majority of this country supports gun control and we have rallied for it for years and years and nothing has changed and so many people have died. We have a poster and we wrote 396 names of kids who have died in mostly school shootings and it's so daunting and depressing. It shouldn't be so easy to get an AR-15, walk into a school, and go shoot 15 kids. James: I really think that change is overdue. There's 396 names on this poster and most of them are school shootings -- and also the Pulse nightclub, San Bernardino, and Vegas. I think that with social media we have the means to organize an event and we can talk to each other and share our opinions and grow. Everyone believes there should be a change ... there are different ways to go about it. I just think school should be a safe place. It's far too easy to access a gun in this country. I just think we need stricter gun laws. I also think it's unfair that mental illness is only discussed in the context of a shooting. Ashauna: I think it's important for me to be here today because if we don't change it no one else is going to change it. We have to do it ourselves. No one else is going to do it for us. I think it's unfair that people think they can just use guns and kill people whenever they want to. It's not fair. It's like someone coming and taking everything that you ever wanted and just leaving you there in the dirt. My older sister is talking about how kids at her school walked out but they got suspended. I think it's ridiculous to suspend someone for doing what they believe. Shardaiah: I don't think that the shootings are right and the government isn't doing anything to help it. I want to see people have to be able to be trained before getting guns. Random people shouldn't be able to go into the store and just buy guns. Carley: The reason our signs are in sign language is because I think it's important for law enforcement and the rest of the population to be educated on people who are not neuro-typical -- people with autism and people who are deaf and people who have different abilities -- because someone who is neuro-diverse might not act the same way as others to police officers or someone who is telling them to do. I think it's important to show what you care about and have your voices be heard. I'm hoping we will get better gun control. Hopefully people will feel safer in classrooms. Not to completely eliminate guns because we do have the right to bear arms, but there is no reason for assault weapons or anything that can kill multiple people -- safety is the common ground. Hannah: I had a friend who was shot, not in a school shooting -- it involved drugs. I didn't know him that well, but he went to my school and it was still very startling and rough to hear. I am here for him and for a lot of the people who are on the news -- and those who haven't been on the news because they haven't been represented. Why do you think this movement has taken off the way it has? Hannah: Social media is at play in this. I don't think there is anything different about this generation. I think everyone has the potential and wants to do this, but it just takes a few brave individuals to start the whole movement. I want to see people in positions of power in the government acknowledge the amount of people gathered here and supporting this movement and the people who are affected by it. It is so simple we just want to be safe we want to live. 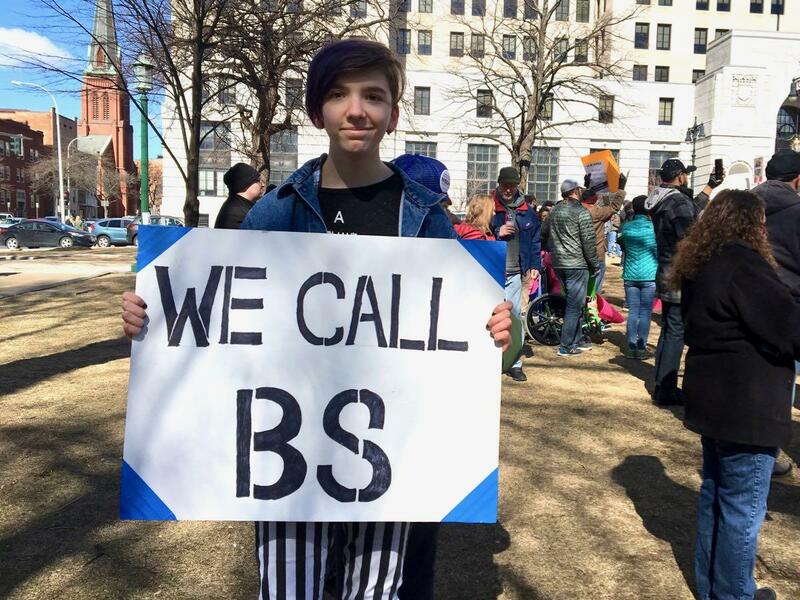 It's so shocking that we have to gather in marches to communicate that. 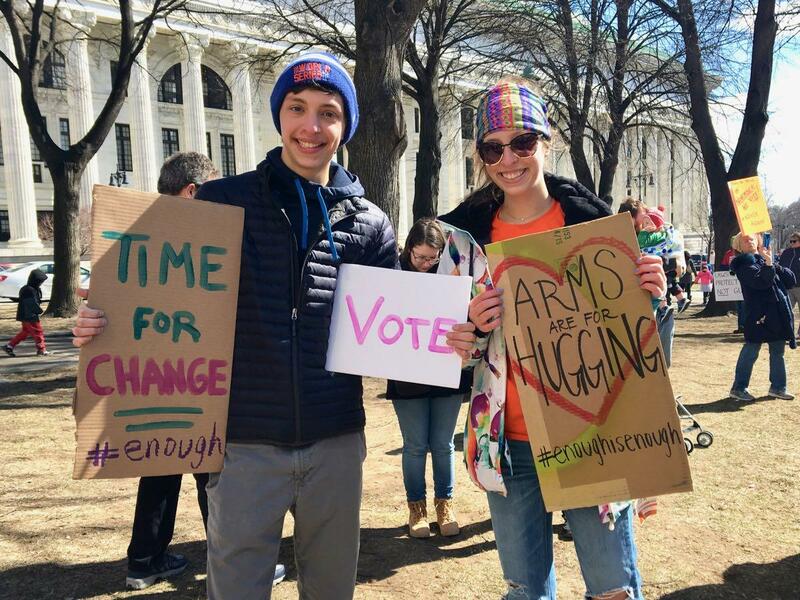 Kate: I just wanted to be a part of something that would enact change and help make stricter gun control laws to help make a difference and stop these shootings. Schuyler: I realize that these kids that are being killed are kids like my friends and I, and I couldn't even imagine being put in a situation like they were placed in at our age. I don't think anyone in the US needs an AR-15 because the only thing brought from them is shootings like we saw in Parkland. I don't think anyone likes to see school shootings. I mean even people who own guns and are pro-gun have children in school. They don't want to see their kids be killed in a space that is supposed to be safe and encouraging. Ofu is second from the left. We are all in Amnesty International and we are a human rights org and we know we can't change everything in the world, but we can start small and we can do something like this that makes a difference. I have on this sign all the names of all of the victims from Sandy Hook and Parkland and I also have Tamir Rice and Trayvon Martin because they were also children. I'm just here because we are tired of seeing children die. We are all tired of seeing children die. Having lives cut short by something preventable is not something that I want to ever see again. And we always say never again -- and this time we mean it. I think the common ground is the realization that lives matter and when there is something wrong we have to go out and fix it and this is a problem that has not been fixed. I went to school in a post-Columbine world. I thought the adults would handle this, but they are not handling it. So we're going to handle it. Listen, we're woke and we're ready and you guys have been feeding us a steady stream of Hunger Games and dystopian futures and we're taking over, so I mean watch out -- that is the difference. The difference is that we know that we can make a difference and we are ready and we have the tools. 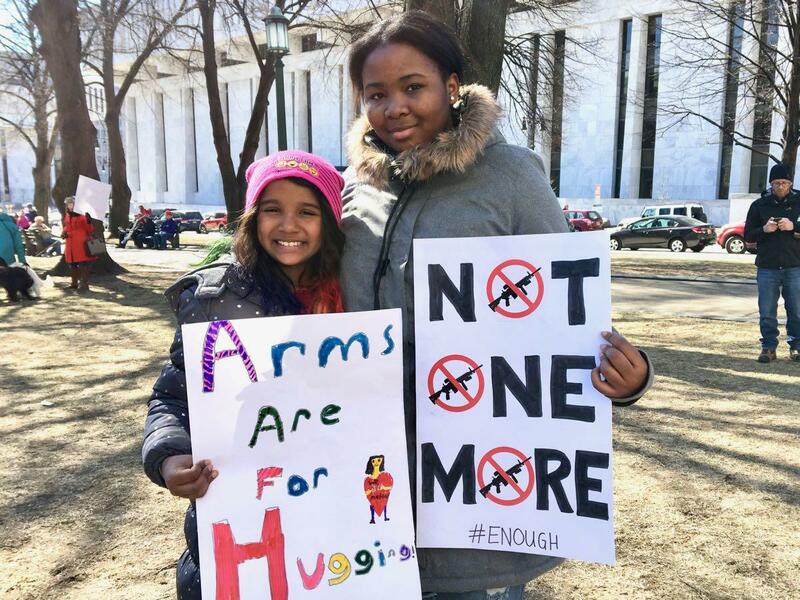 Zairah: I'm here because I'm sick of innocent lives being shot down by the bullet of a gun and all those dreams and hopes being taken away by a trigger. I feel like enough is enough and I think we all need to stand together and demand action. I believe some people believe they want guns to protect themselves. And we want gun control, not banning guns altogether, so I believe we can work together to make more mental checks and background checks so we can be safe. 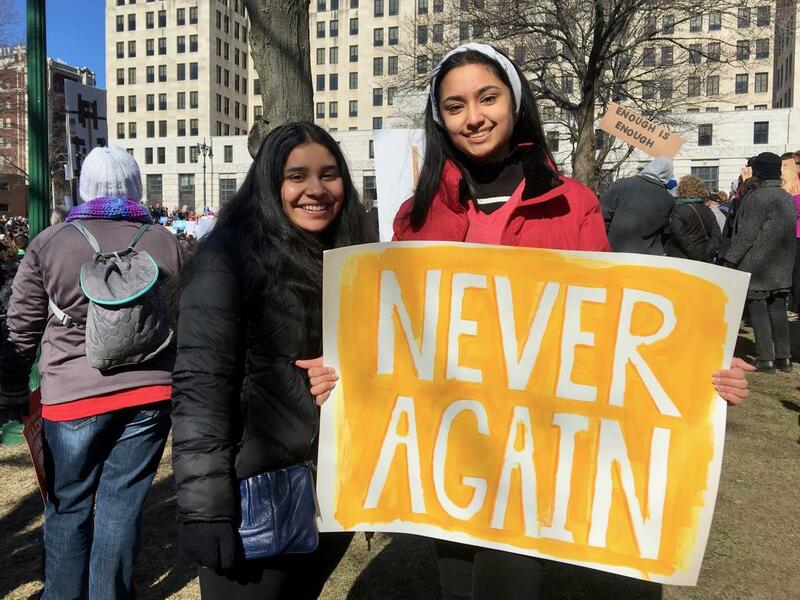 Apurva: For as long as I've been in school I've had to deal with lockdowns, so I'm really proud of seeing everyone my age fighting for a change. It's time in our country to get rid of gun violence. I wish we didn't have to have drills because I think school should be a place to learn and feel safe. Emma: At our school we had a shooting in 2004. We had an assembly where the guy who got shot in 2004 came to talk to us. So it's very close to us. I'd like to see any legislation that can change gun control. I think right now it's being talked right over. But I think we are moving in the right direction. Riley: I think coming out and convincing people to vote is important. I think the big army guns -- we need restrictions on those. I'm not against all guns, but assault rifles are not necessary for all people to have. I think the younger generations are the voice of the future -- the change for the future -- so the earlier we start the better.